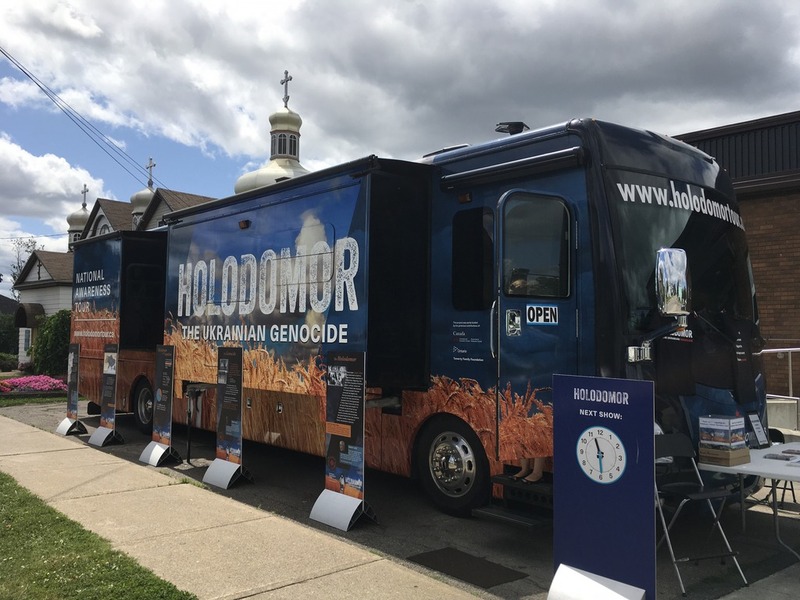 The Holodomor National Awareness Tour (HNAT) continued its travels across Canada this past summer, engaging communities and schools about the Holodomor, the famine genocide of 1932 – 1933. 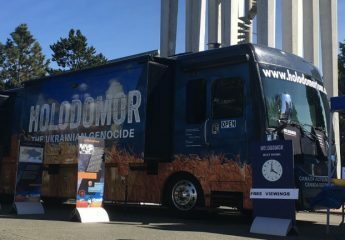 From Southwestern Ontario to the Maritime Provinces to Vancouver Island and back to Ontario, the Holodomor Mobile Classroom (HMC) has been on the road this summer since July visiting, communities throughout Canada, many for the first time – Moncton NB, St. John NB, Halifax NS, Sydney NS, Prince Edward Island, Victoria, Vancouver and Richmond BC. Visitors to the HMC at community events continued to express their gratitude for the opportunity to learn about this tragedy while questioning how the Holodomor was hidden for so long. Visitors viewed the following on board the HMC: The Holodomor Story (adapted from “Soviet Story” by Edvins Snore), Ariadna Ochrymovych’s Voices of Survivors, the Ukrainian Canadian Research and Documentation Centre’s Harvest of Despair, Canada-Ukraine Foundation’s Stalin’s Secret Genocide and the newest release Hunger for Truth: The Rhea Clyman Story. These documentaries tell the Holodomor story from different perspectives. Some focus on survivors’ testimonies, while others feature leading historians and most importantly showing archival documents and film footage uncovered since the early 80’s. The Holodomor National Awareness Tour continues to engage students throughout Canada with a one-hour interactive lesson. During this lesson students become “detective researchers” looking at artifacts to get a better understanding of what was happening during the time of the Holodomor. Learning about a past atrocity can prepare students to take a stand in preventing them from happening today. The Holodomor National Awareness Tour is currently working on a second lesson, Breaking the Sound Barrier, which develops the students’ critical thinking skills to understand the importance of standing up against misinformation that is prevalent in today’s media. Canada’s values of social justice, tolerance, equity and human rights are highly regarded throughout the world, and it is up to our youth to safeguard them for everyone in the future. 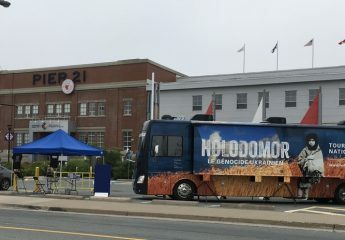 Since the Holodomor National Awareness Tour took to the road two years ago, over 24,000 students, teachers and members of the public have been on board the HMC. 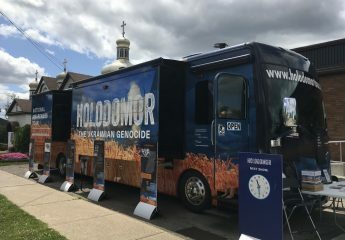 In 2017 alone over 13,000 people have visited the Holodomor Mobile Classroom. Our journey of Holodomor awareness continues across Canada, ensuring that the story is told and never forgotten. May the memories of those who died be eternal. After several years of initial efforts by the Friends of NAUKMA, CUF took over the management of all Canadian support for the Kyiv Mohyla Institute, now the National Kyiv-Mohyla University. Very significant funds have been directed over the years, to the development of this celebrated University. This support continues today. 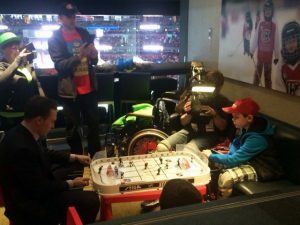 In 2015, Mykola Nyzhnykovskyi arrived in Canada a triple amputee. He returned to Ukraine a year later a “cyborg." That’s what his sister called him after seeing him outfitted with state-of-the-art prosthetic legs and arms he’s now using thanks to the hard work and generosity of a diverse group of Canadians. W5 first met the 11 year old Mykola in Kyiv while reporting on the work of Canadian medical professionals who volunteered to treat victims of the war that’s been raging in Ukraine’s east since 2014. At that time, Canadian surgeons removed shrapnel that had been lodged in Mykola’s face months earlier in a deadly blast that took his brother’s life. The boys had been fooling around with an unexploded munition left carelessly on an artillery range in the village of Volodarske about fifty kilometres from the front line of the military conflict. Mykola was one of dozens of patients treated during the wartime medical missions organized by the Canada Ukraine Foundation (CUF). When Shriners Children’s Hospital in Montreal learned about Mykola’s plight, they decided to extend a healing hand to the child. What followed was a year of care in Montreal, as Mykola and his mother Alla made the journey to a distant land whose language they did not speak. Nine different medical specialists tended to his many ailments, more than five hundred hours of care were dedicated to his recovery, led by Shriners’ Chief of Staff Dr. Reggie Hamdy. His physiotherapist, Rochelle Rein, recalled first meeting Mykola: “He was kind of curled into himself. Hard to express, but he was just very alone,” she told W5’s Victor Malarek. Occupational therapist Sarah Cachecho had the job of helping right-handed Mykola learn to use his left hand and a new prosthetic arm. By the end of his year in Montreal, his progress was remarkable. Mykola had grown bigger, stronger and more determined than ever to master his prosthetics and walk again. “Mykola can now dress himself, feed himself, brush his teeth, do whatever someone has to do in their daily life,” Cachecho said. Krystina Waler, CUF’s director of humanitarian initiatives, says Mykola is very fortunate, because he’d never had received the same level of care in Ukraine. “Rehabilitation there would have been non-existent, the physiotherapy, the occupational therapy,” Waler explained. Shriners covered all the medical costs, while CUF arranged accommodations, travel, food and translators through donations and volunteer work. “To watch life being brought back into him has been an amazing journey and I can’t wait to continue watching it,” said Waler. Mykola and Alla returned to Ukraine in late 2016, but the Canadians are not done with him yet. He’ll be back at Shriners in Montreal every year for check-ups and new fittings for his prosthetics. And the doctors of CUF’s fifth medical mission to Kyiv in February 2017 will continue working on the scars on Mykola’s face. Nobody can bring his brother Danyo back, but Canadian generosity and hospitality did help bring back two things that weren’t there when W5 first met Mykola: hope and a smile.